Those Virginia Sheriff elections can get kinda heated. When Jim Adams decided in 2009 to run against 17-year incumbent B.J. 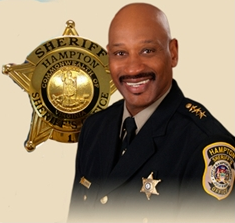 Roberts for the post of Sheriff in Hampton City, Virginia, little did he know he'd be kicking off a train of events that would lead to the Court of Appeals pronouncing the Facebook Like as protected speech under the Constitution. That's the decision that was handed down September 18th by Chief Judge William B. Traxler Jr. "In sum, liking a political candidate's campaign page communicates the user's approval of the candidate and supports the campaign by associating the user with it," said Chief Judge Traxler. "In this way, it is the Internet equivalent of displaying a political sign in one's front yard, which the Supreme Court has held is substantive speech." It got this far because Roberts, on seeing that half a dozen of his staff had hit the Like button when Adams announced his candidacy on Facebook, made sure that all six weren't given their jobs back when Roberts won re-election. "It is worth noting, however, that there is no indication that Sherriff Roberts was under a misapprehension of the law," the court notes. "At his disposition, Roberts stated that he did not believe he was entitled to fire the plaintiffs 'for political reasons.'" But there were some indications that suggested this was precisely what had happened, and so they went to court, only to be turned back at the first hurdle when a Federal District judge said a Facebook Like wasn't significant enough to count as protected speech. Up pops Facebook and the ACLU, which file an amicus brief on behalf of the plaintiffs, and then the Court of Appeals had its say. Now the case goes back to the lower courts, which will have the final say on whether or not the terminated plaintiffs get their jobs back. Given that their old boss was the fella who allegedly said "that he would be Sheriff for as long as he wanted and that his train was the 'long train'" - guess whose was the short train - according to the Court of Appeals, perhaps they oughtn't to be in such a hurry. Nevertheless, it's a win for Facebook if nothing else; now you can Like with the knowledge that it's protected speech.